Memories in bronze are also ambulatory. 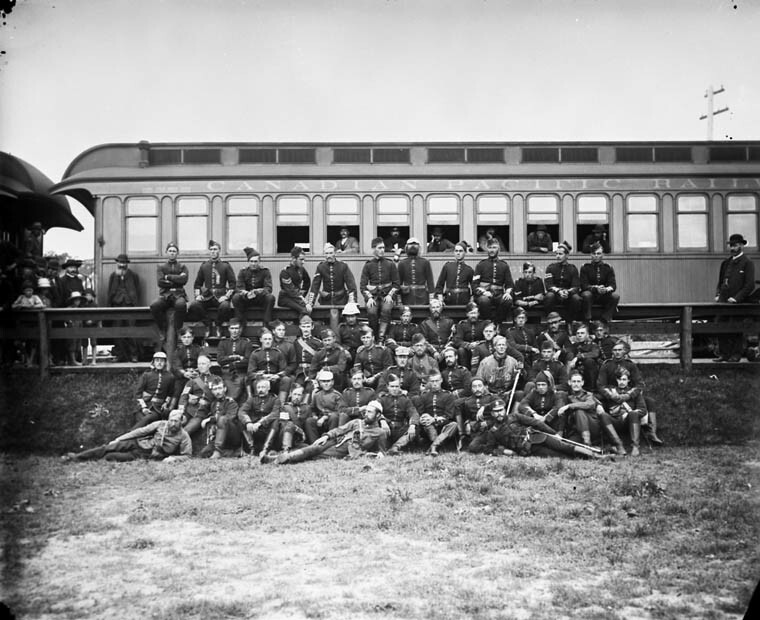 The Ottawa Sharpshooters returning from the North West Rebellion, July 1885. Photo taken at Smith’s Falls, ON. Source: LAC, Topley Series E, MIKAN No. 3406961. 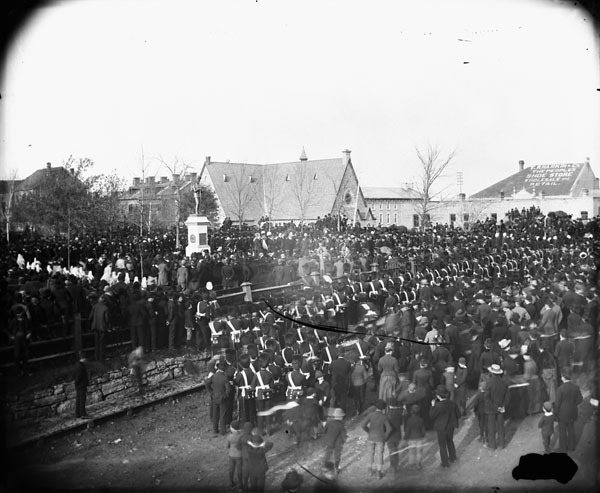 The Ottawa Company of Sharpshooters returned from the west in July 1885 and a fund was quickly begun in order to erect a monument to their achievement. 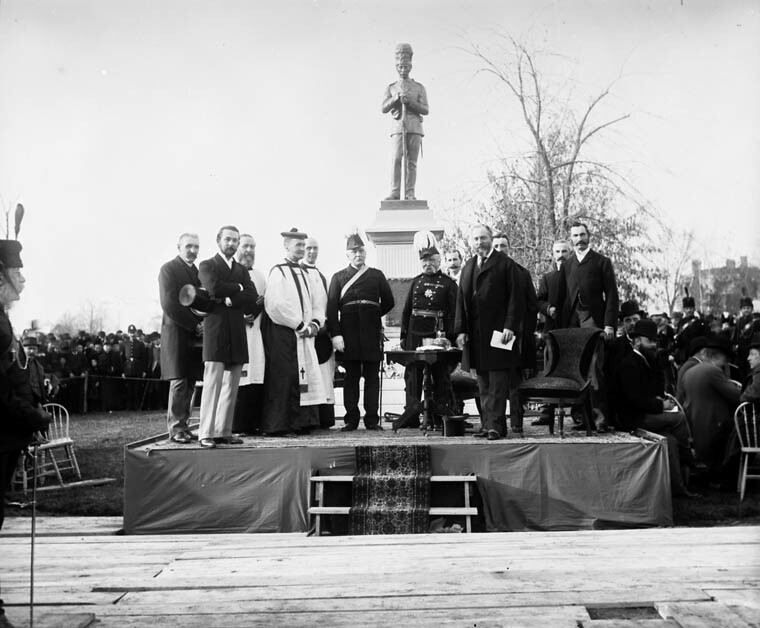 By 1888, sufficient funds had been collected and that November, the new memorial was revealed at the entrance to Major’s Hill Park, where Chateau Laurier currently sits. Of course, the growing city did not have the luxury of keeping such a monument in what would become a central location and it was relocated in October of 1911 to make room for the hotel’s construction . The memorial was next placed on the grounds of Ottawa’s City Hall (constructed in 1877), just down Elgin, past the Russell House Hotel. That did not mark the end of the journey for the memorial, however. In 1931, City Hall burned down. 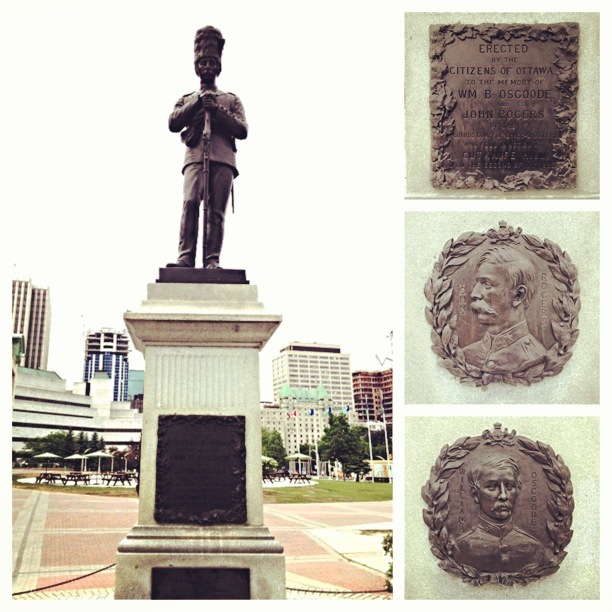 Although city hall was gone, the Sharpshooters’ memorial, along with the more recent Boer War statue, remained on site until the construction of the National Arts Centre began in 1965. 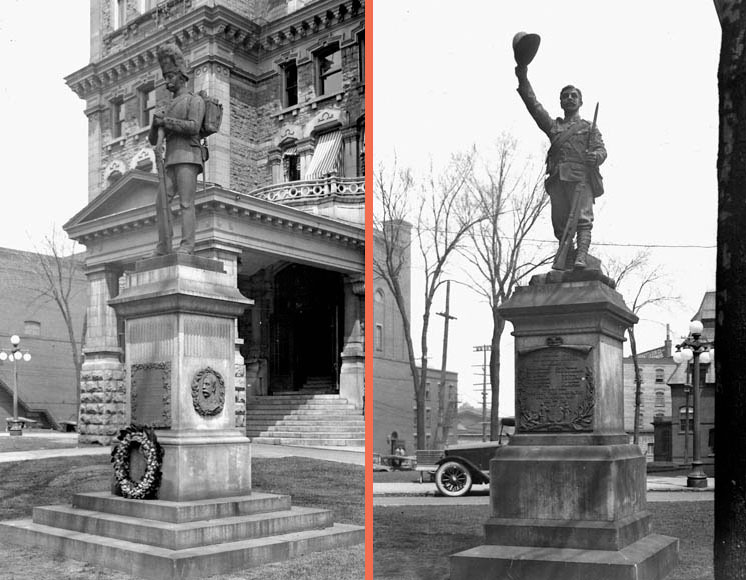 Sharpshooters’ and Boer War memorials outside Ottawa City Hall. Source: LAC, Department of the Interior Photographic Records, Series OT (Ottawa), MIKAN Nos. 3359048 and 3359047. Crews clearing the site located a medal. Source: Vancouver Sun, February 4, 1965. Once again, the memorial had to move. Site preparations for the construction of the new Canadian Centre for the Performing Arts (now the National Arts Centre) began in 1964/65. 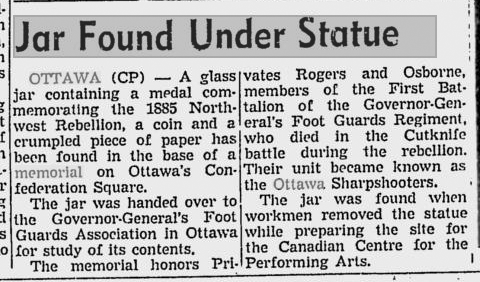 When crews were removing the statues (to Confederation Park), a jar containing a commemorative medal and some paper was found in the base. Both memorials remained at peace until 2006, when the Sharpshooters’ Memorial was moved across Laurier to rest outside of the Cartier Square Drill Hall. The Boer War memorial, however, remains in its more sylvan home at Confederation Park. Brault, Lucien (1946). Ottawa Old & New. Ottawa: Ottawa Historical Information Institute, pp. 164-5. Taylor, John H. (1986). Ottawa: An Illustrated History. Toronto: Lorimer, p. 99. 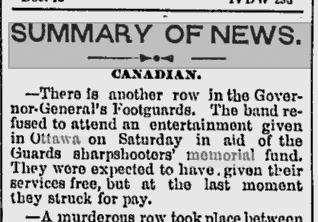 Thank you.Among my Father’s personal items was a medal engraved North West 1885 Canada.My grand father Charles D Matheson was a member of the GGFGs and,until reading this ,we did not know how he came to be a member of the Sharpshooter unit.